There is no shortage of interesting facts about intelligent animals, especially when it comes to the Scarlet Macaw. These birds, who are known for their beautiful bright plumage, are also curious, strong willed and highly trainable in captivity. What distinguishes the Scarlet Macaw from other Macaws is its white face and yellow feathers on its wings. Their natural habitat is in the South American rain forests where it is moist and humid. Their intelligence and beauty are two reasons why people keep them as pets, but because of their ability to become aggressive they do not make good pets for kids. Click here for a great selection of Amazon.com books about Scarlet Macaws. Scarlet Macaws are one of the most intelligent bird species. When in captivity, they are able to mimic words and sounds and learn tricks. Because of these abilities, they are often seen in pet bird shows. Studies have concluded that Scarlet Macaws have the intelligence to distinguish colors and shapes. with the right trainer, some of these birds can even perform simple math problems. Scarlet Macaws are said to have the intelligence of a 4-8 year old child with the emotional intelligence of a 2 year old. This means that they can be demanding and cranky and even throw temper tantrums if not given proper attention. The Scarlet Macaw can often out live humans, in captivity they are known to live up to 80 years while in the wild they can live approximately 40-50 years. With extremely powerful beaks, the Scarlet Macaw can easily crush nuts and seeds to eat. It also uses its beak as a climbing aid and to crunch on branches to keep busy. Scarlet Macaws are very loud birds that make a variety of low-pitched sounds including squawks, screeches and screams that can carry for up to a couple of miles (kilometers). In the rainforest these vocalizations help them to make their presence know and call to their groups. Because people will pay a lot of money to own the Scarlet Macaw, every year thousands are illegally trapped and smuggled without proper permits. The population has suffered a decline in areas were deforestation and illegal trapping are consistent. This has landed this bird on the list of endangered species. Some of the species of Macaws have already become extinct. During breeding season, which is between October and April, the birds can become very territorial and even aggressive. The Scarlet Macaw generally mates for life and nests high up in the cavities of deciduous trees. The female usually lays 1 to 4 eggs and both male and females care for the young. 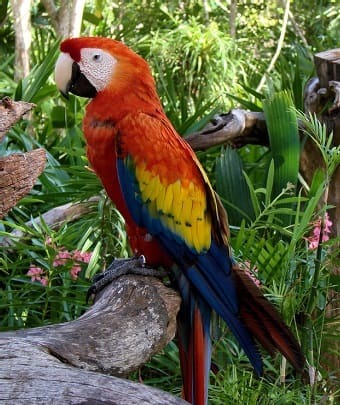 The Scarlet Macaw has beautiful bright colors of green, yellow, blue and red. This helps them to blend into their natural habitat in the rainforest. Weighing about 2.2 pounds (1 kilogram), the Scarlet Macaw, with a wingspan of over 3 feet (1 meter) is the largest parrot in the world. In addition to strong beaks, they have strong, flexible toes. They have two that point forward and two that point backwards that are used like hands to grab and move things.